Santa Barbara is a charming, gated community located in the heart of Boca Raton. This private neighborhood is encompassed with lush tropical landscape, colorful plantings, and a sparkling lake situated right in the center of the beautiful community. Developed in the early 1990's by award winning builders Ahmanson Developments and Marlex Housing, this lovely development was created to mirror the city of Santa Barbara, with its light pastel colors and walled streets pervading throughout this little slice of heaven. Of course, these amazing residences also offer impeccable views of perfectly-manicured lawns and/or the tranquil lake that so many enjoy observing. 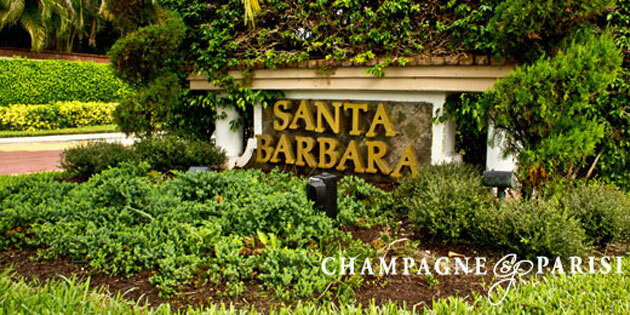 Accordingly, homes for sale in Santa Barbara range from $400,000 to just over $700,000. Although it may come as a surprise to some, living in Santa Barbara genuinely offers you country-club-style amenities without country club fees. These world-class amenities begin with the magnificent clubhouse, which features banquet rooms, billiard rooms, and card rooms. Residents also enjoy the state-of-the-art, fully-equipped fitness center with effective equipment, as well as the oversized, heated swimming pool that overlooks the natural lake. You can also enjoy a whirlpool spa, picnic areas, and clay tennis courts. Of course, if you want to get out of Boca Raton, I-95 and Florida's Turnpike are conveniently close, thereby offering easy access for a quick trip to West Palm Beach, Ft. Lauderdale, or Miami. Clearly, there is more than meets the eye in this wonderful community, probably a testiment as to why so many desire to call Santa Barbara home.